In the late afternoon of the 5th October 1879, after a fiercely fought contest in the arena of Cordoba, a bull named Murciélago from the stud farm of Joaquin del Val di Navarra had his life spared by the famous matador Rafael Molina "Lagartijo". This was a very rare occurrence in bullfighting, and an honour accorded only to those bulls that have shown exceptional courage and spirit in the arena. And Murciélago was indeed such a bull. He was subsequently donated to the breeder Antonio Miura, and went on to father a formidable line of fighting bulls that extends right down to the present day. The bull has always been a symbol of power, aggression and courage: characteristics that are shared by all cars of the Lamborghini marque. In depictions of bullfights, bull and matador together form an emblematic unit, an antithetic combination of brute force and elegance. And it is this symbiosis of violence and beauty that makes the spectacle of bullfighting so fascinating. In the context of the arena, the indomitable spirit of the bull becomes a lethal combination of agility and muscular strength, which must be overcome by the grace and skill of the matador. True to the tradition in which the bull has always been the symbol of the prestigious motorcar company founded by Ferruccio Lamborghini - born under the sign of Taurus, no less - the management at Automobili Lamborghini have decided to baptise the latest car in the noble line with the name of a fighting bull. And so, after a succession of names linked to the world of the corrida, such as Miura, Islero, Urraco, Bravo, Jalpa and Espada (the latter being Spanish for sword, the weapon of the matador, and thus a symbol for the matador himself) we now have Murciélago - which coincidentally also means "bat" in Spanish. An unusual name, perhaps, but nonetheless one that effectively expresses the dynamism, elegance and power of the latest thoroughbred to emerge from the Lamborghini stable. The Lamborghini Murciélago is 2-seater, 2-door coupé (with the now familiar gull-wing doors) based on the traditional Lamborghini layout: mid-mounted V12 engine, typical Lamborghini transmission with the gearbox mounted in front of the engine and the rear differential integrated into the engine unit, permanent four-wheel drive with central viscous coupler. This layout, successfully employed by Lamborghini for more than 30 years, affords an optimal weight distribution (58% rear and 42% front) with conspicuous advantages for traction, braking and handling. The suspension design (independent double wishbones) represents the best possible solution for a high-performance GT and, again, is in keeping with Lamborghini tradition. The external bodywork panels are made from carbon fibre, with the exception of the steel roof and door panels. The rear of the car features two "active" intakes for the engine cooling air. With the exclusive VACS ("Variable Air-flow Cooling System"), the aperture of these air intakes can be varied to suit the driving conditions. Furthermore, to ensure correct aerodynamic equilibrium at all speeds, the angle of the rear spoiler can also be altered. According to the speed of the car, the rear spoiler can assume three different positions: closed from 0 to130 km/h, partially open (50°) between 130 and 220 km/h and fully open (70°) above 220 km/h. Depending on the aperture of the air intakes and the position of the rear spoiler, the car's Cx coefficient varies from a minimum of 0.33 to a maximum of 0.36. Bi-xenon headlights produce both main and dipped beams. For the windscreen wiper, it was decided to adopt the proven single-arm pantograph design. This system increases the area swept by the wiper blade, thereby reducing blind spots in the visual field of the driver, and operates correctly at high speed without obstructing the driver's view when at rest. The wing mirrors can be folded electrically and are mounted on long support arms so that the driver can see beyond the rear wings, which are especially prominent when the air intakes are open. However, mirror stability is not compromised, even at high speeds. 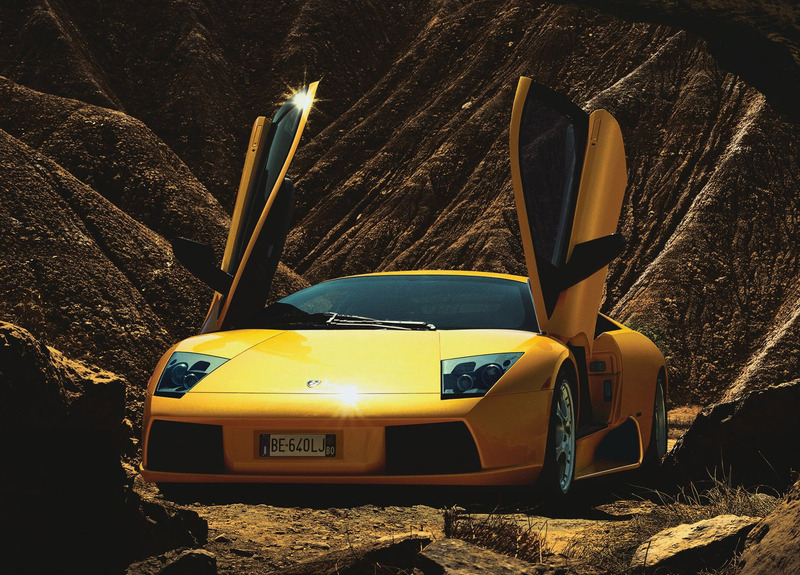 The "mission" was to design a worthy successor to the Lamborghini Diablo: the new car had to be exciting, unmistakable, but also safe and ergonomic. Lamborghini's brief to the designer was simple: "We'll make the engine, you design the body to fit". The result is a creation in steel and carbon fibre precisely tailored to suit the engine, that enhances the performance of its twelve cylinders. The central concepts of the design are purity of line, muscularity, aeronautical influence, efficiency and "made to measure". Certainly the lines of the Lamborghini Murciélago do justice to its illustrious heritage and echo the styling features of some of the most significant icons to be produced by the marque. In its lines can be seen the wedge shape of the Countach, the sensual tension of the Miura and the dramatic proportions of the Diablo, with its futuristic cabin. 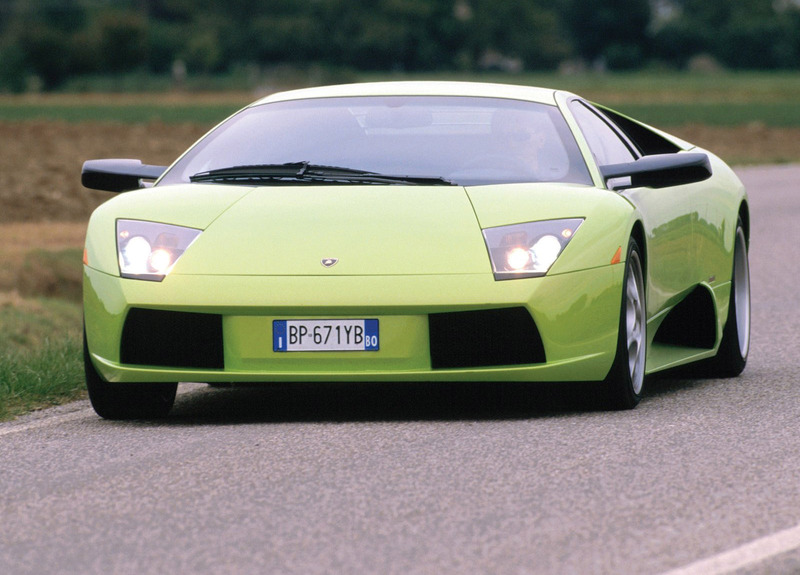 One of the key styling features of the Lamborghini Murciélago is the way the cabin is seamlessly integrated in the lines of the body: this distinctive approach, previously encountered on both the Countach and Diablo, has a single arc extending from the front to the rear that emphasises the overall wedge shape of the car. The Lamborghini Murciélago is a superlative car, with a mechanical structure that neither allows nor requires any gimmickry; the styling must reflect this and is therefore free of superfluous ornament or embellishment. Pure, simple lines are all that is required. 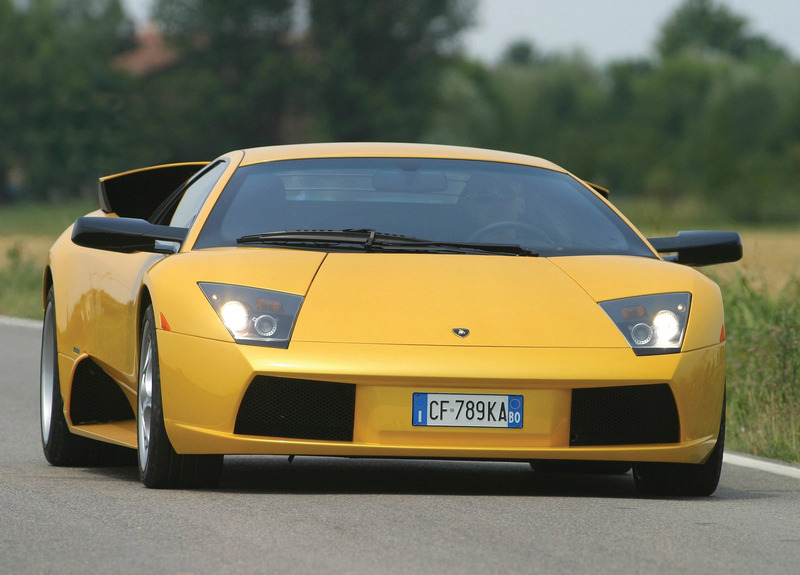 The Lamborghini Murciélago has a strong athletic stance, achieved by reducing the front and rear overhangs and by visual emphasis of the muscular contours above and around the wheels. The complex interplay of the body curves as they flow seamlessly into one another creates a subtle tension. The silhouette, characterised by strong, purposeful stance and sharp angles, draws inspiration from the famous stealth fighters. The designs of the dynamic cooling and handling surfaces originate from the field of aeronautical engineering: a field in which, more than in any other, function dictates form. But above all, the design has to be efficient. Every technical function is performed by an active system: in this way the aerodynamic efficiency of the car is not compromised by any superfluous thermodynamic or aerodynamic appendages. The Lamborghini Murciélago's engine - which complies with the strictest emission standards in the world, including those of the United States, Japan and Europe - is a 12-cylinder 60° V with a displacement of 6192 cc, made entirely from aluminium alloy and designed for unleaded fuel, producing 580 CV (426 kW) at 7500 rpm and 650 Nm torque at 5400 rpm. Torque delivery is optimised across the entire engine operating band (even at engine speeds relatively low for a sports car) thanks to the adoption of a variable-geometry intake system (VIS), variable valve timing (VVT) on both inlet and exhaust camshafts, and the "drive-by-wire" electronic throttle control, which makes for reduced emissions, improved idle speed control and improved driveability. Particularly noteworthy is the fact that at just 2000 rpm, the Murciélago produces more torque than maximum value attained by the majority of Granturismo cars in today's market. Unlike its predecessor, the Lamborghini Murciélago has a dry sump lubrication system that allows the engine to be positioned 50 mm lower, with a consequent lowering of the centre of gravity. The variable intake system, which essentially alters the geometry of the intake system upstream of the primary intake passages, provides three different operating modes obtained by the opening and closing of two butterfly valves (one on the plenum chamber and one on the by-pass pipe), the operation of which is entrusted to the Lamborghini LIE engine control units. The VACS ("Variable Air-flow Cooling System") is an entirely new concept in air intake technology. A high-performance car obviously requires a high-power engine. And, in turn, a high-power engine needs an efficient cooling system with appropriately proportioned air intakes. In a conventional fixed system, these air intakes have to be dimensioned to suit the most extreme operating conditions, such as, for example, very high external air temperatures, even though these conditions are rarely encountered during normal running (accounting on average for only 15% of the vehicle's total usage). This means that air intakes have to be made too large for average use, thus compromising the car's aerodynamic characteristics and performance. To avoid this compromise, Automobili Lamborghini S.p.A. has designed a variable air-flow cooling system in which the aperture of the air intakes can be altered to suit the cooling requirements of the engine and the external air temperature. As a consequence, the car's aerodynamic characteristics are only compromised when necessary, which, as stated previously, amounts to only about 15% of the total vehicle usage. The essential characteristics of the system are as follows: the system comprises two rear lateral air intakes that pivot to assume two positions: closed (O°) or open (20°). The change from one position to the other can be controlled either automatically on the basis of the operating conditions (engine coolant temperature and external air temperature) or manually, by the driver pressing a button (only with the engine running). The opening and closing of the air intakes is controlled by a dedicated PMC electronic control unit, the same unit that controls the movement of the rear spoiler. Should the movement of the air intakes be obstructed, a safety system alerts the driver by way of a warning light. The management and control of all the engine and vehicle operating parameters is entrusted to a system comprised of 3 "master" control units and 1 satellite control unit, made up as follows: 2 Lamborghini LIE engine management units, 1 Lamborghini GFA auxiliary function management unit and 1 Lamborghini PMC ("Power Motor Control) satellite control unit. All these electronic control units are interconnected by way of a CAN BUS. More precisely, each of the 2 LIE units (with 32 bit/20Mhz microprocessors) controls one of the two banks of cylinders, each LIE being equipped with an identification pin for the purposes of unit recognition and function differentiation, whereas "body" control functions are managed by the GFA and PMC units, each with a 32 bit/20MhZ microprocessor and 80-pin connector. Control algorithms developed to ensure compliance with USA, Europe and Japan standards. As mentioned previously, the Lamborghini Murciélago has a new 6-speed gearbox, while the transmission maintains the traditional Lamborghini layout. To increase the general rigidity of the system and improve basic stability in operation, the primary shaft and the secondary shaft are each mounted on three bearings (as against 2 on the Diablo). Gearbox lubrication is forced, with a pump mounted inside the gearbox itself. Use of the latest generation double and triple-cone synchronizers and optimisation of the control linkage have allowed for an appreciable reduction in the effort required to change gear. The rear differential is flange mounted to the engine so that it can be replaced without having to remove the complete powertrain from the car. The clutch control system has been optimised by the fitting of a slave cylinder on the axis of the clutch release bearing, the result being a significant reduction in the force required to operate the clutch pedal. 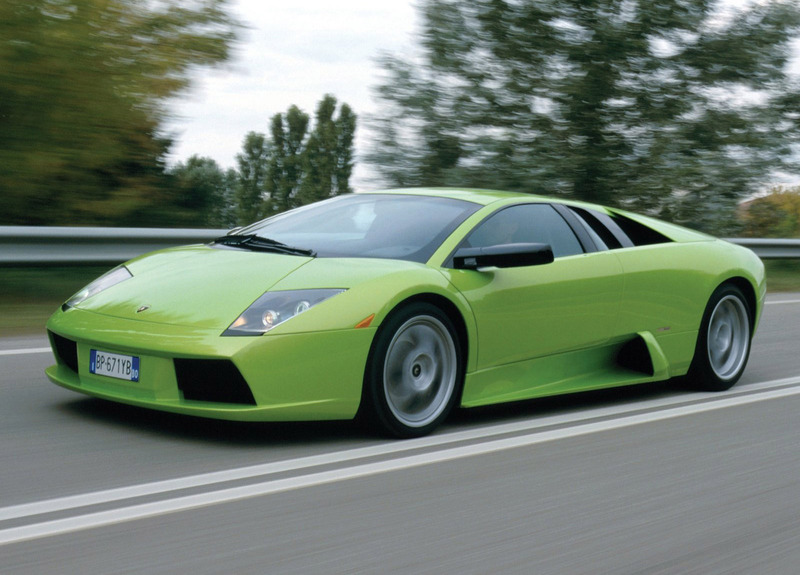 The Lamborghini Murciélago, like its predecessor the Diablo, is equipped with permanent four-wheel drive and a central viscous coupling (Viscous Traction System), with 45% limited slip and the front with 25% limited slip.This solution represents an active traction control system: excess torque on the primary axle (rear) is automatically transferred to the secondary axle (front) to maintain ideal traction at all times. Furthermore, in order to meet the demands of extreme driving, Lamborghini has also developed a traction control system that acts on the engine itself. When the limits of grip are reached, driving torque is suitably reduced by intervening on both the throttle (by way of the DBW system) and the injection/ignition systems. The Lamborghini Murciélago chassis has been stiffened considerably to achieve a torsional rigidity value in excess of 20,000 Nm/°. The attainment of this value was one of the fundamental objectives of the design programme, and translates into a significant improvement in the car's performance: improved suspension behaviour and handling, greater driving comfort and an appreciable reduction in interior noise. The chassis consists of a frame made of high-strength steel tube, with structural elements in carbon fibre/honeycomb. The carbon fibre elements are attached to the steel frame using a combination of adhesives and steel rivets. The chassis, which has a structural steel roof and a carbon fibre floor pan attached to the tubular frame, incorporates pressed steel panels with stiffening ribs, which also have a structural function. at the front end of the chassis, the mountings for the shock absorbers, the torsion bar and the front suspension have all been moved forward by 15 mm (wheelbase=2665mm); some of the tubes and panels in the area of the rear wheel arches have been replaced by carbon fibre panels, these being attached to the perimeter of the tubular frame; the geometry of the lower part has been modified to suit the more forward positioning of the front axle and thereby improve accessibility and increase the space available for the pedals. a new, more rigid removable cross member has been fitted for the rear shock absorber mountings. The independent front and rear double wishbone suspensions, with steel arms and hydraulic shock absorbers with electronic damping control allowing automatic or manual adjustment, have been optimised to improve handling and straight-line stability. The main improvements concern the springs and the shock absorbers, the anti-roll bars - front and rear - and the overall suspension setup. Also worthy of mention are the front "Antidive" and the rear "Antisquat" systems. The springs - two per rear wheel and one per front wheel - are mounted coaxially with the shock absorbers. The spring/damper assemblies are attached to the chassis with Flanbloc bushes. The dimensions of the aluminium alloy wheel rims with concealed valves are 8 ½ x 18" (front) and 13 x 18"(rear); the sizes of the PIRELLI P Zero "ROSSO" tyres are respectively 245/35 ZR 18 and 335/30 ZR 18. The wheel rims feature a new concealed valve design that improves the circulation of cooling air around the brake disks and calipers. The new tyres give a more comfortable ride, reduced road noise and improved handling. Safety is one of the strong points of the Lamborghini Murciélago. The braking system consists of four disk brakes, each with 4 wheel cylinders per caliper, and two independent hydraulic circuits - one for the front axle and one for the rear. The system includes a tandem master cylinder, a vacuum servo brake, an emergency brake and a parking brake. There is also a 4-channel ABS system with DRP (Dynamic Rear Proportioning) and TCS. The TRW type antilock braking system, which forms an integral part of the basic braking system, consists of an electro-hydraulic control unit and 4 wheel speed sensors. The electro-hydraulic control unit, with dedicated microprocessor, receives the signals from the 4 electromagnetic speed sensors mounted on the hub flanges, and calculates the speed and acceleration of each individual wheel. Using this information, the microprocessor is able to detect a tendency to slip on any wheel and modulate the fluid pressure in the corresponding brake line accordingly, in order to restore the correct speed and thereby maximum braking force on that particular wheel. The 4-channel system is able to monitor and control each wheel independently. To maintain the safety guaranteed by the two fully independent braking circuits (one for the front and one for the rear brakes) the hydraulic components of the control unit are doubled up, so that no part of the braking system is common to both the front and rear brakes. In the event of a malfunction of the ABS (signalled by a red warning light on the dash) the basic braking system will still continue to function normally. The DRP function has reparameterised with respect to the previous model to guarantee an optimum distribution of the braking force between the front and rear wheels in all conditions - even those not calling for intervention of the ABS. Passive safety standards have also been significantly improved on the Murciélago: the car is equipped with two airbags, a 60-litre bag with single inflator on the driver's side and a 130-litre bag with dual inflator on the passenger side, which emerges from a new seamlessly upholstered panel. Both airbags are controlled by a new dedicated control unit. The Lamborghini Murciélago complies with all EU, Japan and US safety standards of which we can remember the most rigorous: FMVSS 201 - Occupant Protection in Interior Impact, FMVSS 208 - Occupant Crash Protection, FMVSS 214 - Side Impact Protection, FMVSS 301 - Fuel System Integrity, FMVSS 302 - Flammability of Interior Materials, FMVSS 401- Interior Trunk Releases for child safety, and part 581 - Bumper Standard, of European Directives 1999/98/CE for frontal impact and 96/27/CE for side impact and pole impact. 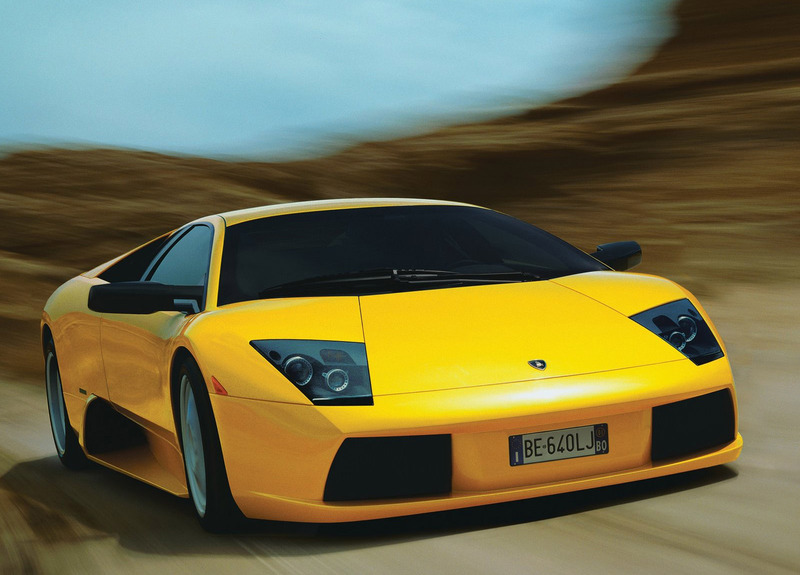 At the wheel of the Lamborghini Murciélago, the driver is in complete control. The clear, accurate instruments and their respective controls are all grouped together on a single electronically-controlled panel, which has undergone numerous aesthetic and ergonomic improvements. This panel is directly interfaced through a CAN bus to a Lamborghini GFA control unit (body computer). The instrument panel includes a trip computer that displays average and maximum speed, maximum acceleration, miles to empty (range), a chronometer and a voltmeter. Among the other driver's aids are an electric control to fold the electrically-heated wing mirrors, the non-reflective rearview mirror, and the axle lifting system that, at low speeds, allows the car's front axle to be raised by 45 mm. The interior features leather upholstery, 3-spoke sports steering wheel (also in leather) and a steel gear lever and selector gate: another refinement that is a long-established Lamborghini tradition. Numerous storage compartments are provided, and the radio and CD autochanger are tailor-made to Lamborghini's specifications. Options include low ratio gears and satellite navigation system. 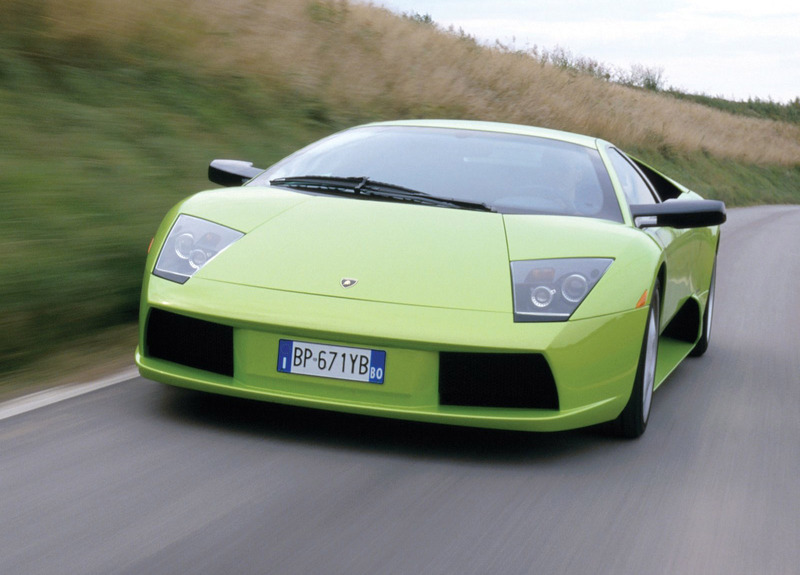 The high-performance characteristics of the Lamborghini Murciélago certainly do not detract from the comfort level, which is significantly improved compared with the Diablo. The first of these improvements concerns accessibility: the door opening angle has been widened by 5° and the chassis side member directly under the door has been lowered by 25 mm. Interior comfort has also been improved, with more room now available for both the driver and the passenger, achieved by redesigning the side members of the roof and increasing the size of the footwell. Interior noise levels are much reduced, thanks to the use of optimised soundproofing materials, the elimination of undesirable noise channels, the adoption of integral panels and by fitting acoustic insulation panels to the wheel arches to reduce road noise. The stiffer chassis also makes an important if indirect contribution to driver comfort. Further improvements in comfort have been obtained by the use of improved thermal insulation on the transmission tunnel and the engine bulkhead. Internal climate control has been greatly improved by the new layout of air outlet vents, an improved system efficiency and a new control algorithm. The Lamborghini Murciélago's climate control system provides the cabin temperature setting ranging between 16 and 31 degrees centigrade, automatic control of the air distribution in the cabin according to the season and the temperature of the outlet air, automatic blower speed control with eight different settings, automatic recirculation and compressor control. The operating limits of the Lamborghini Murciélago's climate control system, which also includes an automatic defroster and full diagnostic functions, are between -29 and +55 degrees centigrade external temperature. 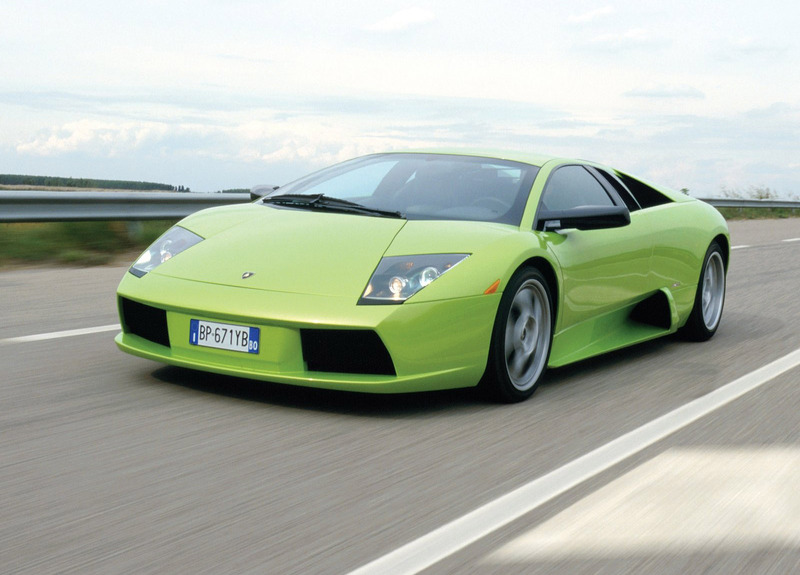 Thanks to the 580 hp (426 kW) (USA version: 575 hp - 423 kW) maximum power and 650 Nm maximum torque output of its 60° V-12 engine, delivered at 7500 rpm, the Lamborghini Murciélago can exceed 330 km/h (205 mph) and accelerate from 0 to 100 km/h (0 to 62 mph) in 3.8 seconds. Compared with previous models, the driveability of the Lamborghini Murciélago is significantly improved, thanks to the smoother torque curve, increased power, the new 6-speed gearbox and the improved electronic engine management system. Handling and high-speed stability are also better, thanks mainly to the improved torsional rigidity of the chassis, the lowering of the car's centre of gravity, the optimisation of the suspension and tyres and - last but not least - the improved aerodynamics. The advances made in terms of driveability and performance, apparent even under the most demanding driving conditions, are matched by an equally significant improvement in driving comfort.